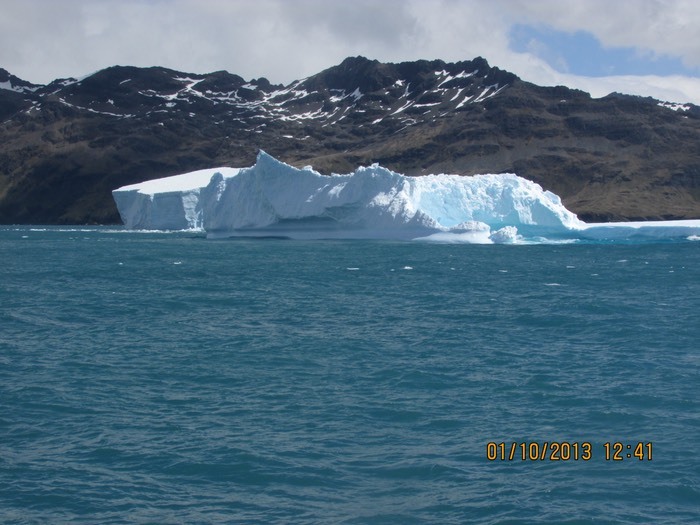 Today was notable for two things - I was seriously coming down with a bug and I saw my first iceberg. Yesterday, we couldn't land on the north side of South Georgia at Salisbury Plain because the swells were just too rough. The first landing site was out of the question. Instead we went to another cove where they gave us an hour zodiak tour. It was very rainy and windy. Jane decided to pass and really, she didn't miss anything. Can't say I got much out of that outing. 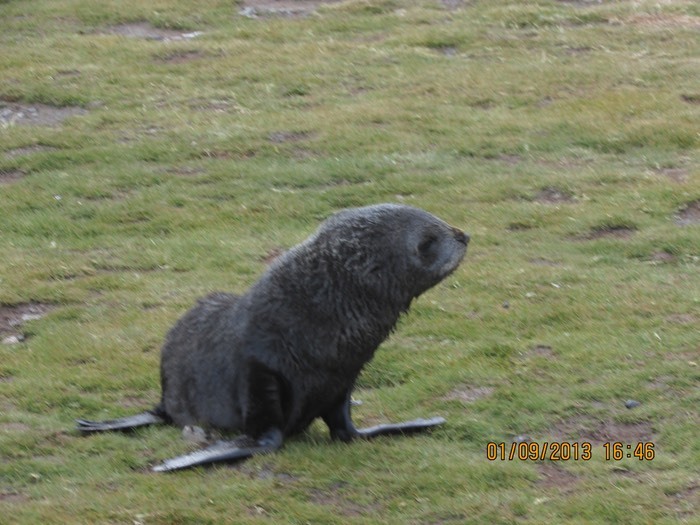 There were fur seals "guarding" the beach. We were told that they are quite aggressive and "nasty." If they approached us, we were to clap our hands and stand our ground. If we ran, they would chase us and they would outrun us. They definitely bite people. Jane commented that in Africa the bush guides carry guns to protect you, but that would not happen here. 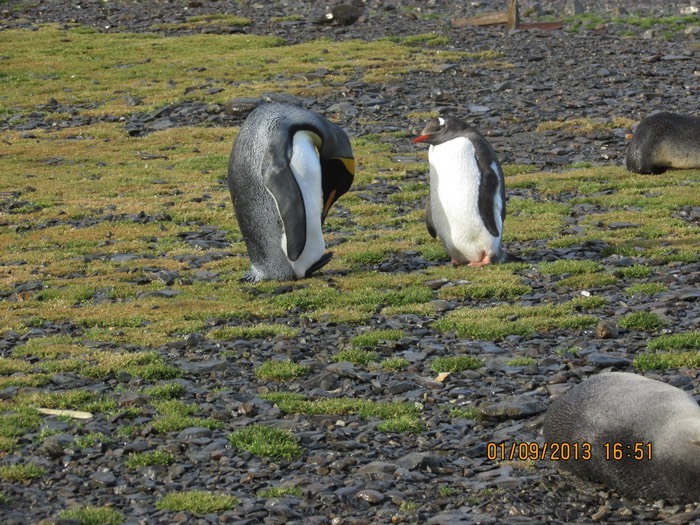 You have to get past the fur seals to be able to get close to the King penguines. The penguins are molting now so they stay very still, usually near water (ocean or stream) and don't interact with visitors. We were told that normally, chicks and grown penguins are curious and it was okay if they approached you, but you were not to get closer than 15 meters. That didn't come up. We took a hike to falls about 1.5 miles from the shore. It was where Shakleton found his way to the whaling station. The rock formations are interesting and the geologist on board explained that normally, the rock is laid down in horizontal layers and when you see slanted layers, it's because tectonic plates shift and bend those layers. At the entrance to the cove we visited, there's a zig-zag pattern to the rock layers. (To me looks more like a parabola.) Apparently, Shakleton looked for that specific rock to know that he had arrived where he was aiming to go. I enjoy taking any walk for any reason, as I miss my daily 4 mile trek with Jim in the forests of Pebble Beach. At this location, the walk was over cobble stone like rocks and we had to cross a stream several times. I was too worried about getting wet at the last crossing so didn't make it to the falls, but I got very close. That was late yesterday evening. 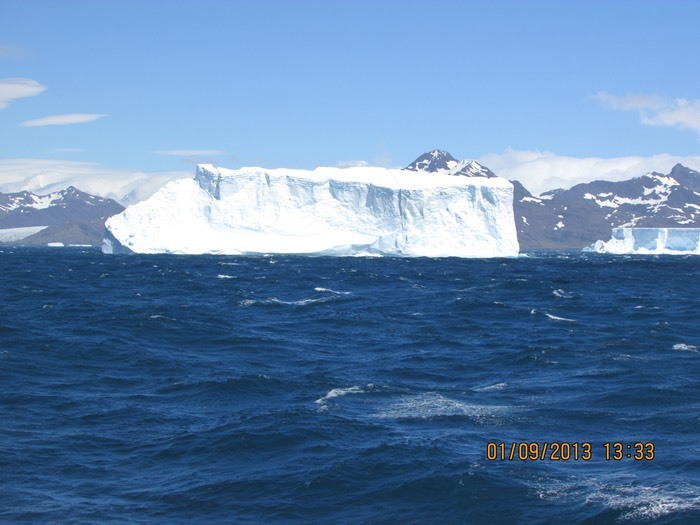 The most eventful thing for me was seeing my first iceberg. The captain didn't even make mention of it in his frequent announcements; I guess because these are the small, insignificant ones. Reminds me of the time Jane's son, Scott came skiing with us and on our drive to Bend, he kept asking, "What's the name of that mountain." We had to explain that our mountains are so much bigger than those on the east coast, so we don't name the smaller ones. We think of them as foothills. The iceberg shapes are amazing. Some look like rectangualr box cars, while some have curvatious silhouettes. Big rectangular ones look like box cars! It cleared up at night, just before we headed out. The tallest peaks in this range are about 9000 feet. Yup, looks like giant melted ice cubes. Most of the day, it was overcast and rainy like you see here. 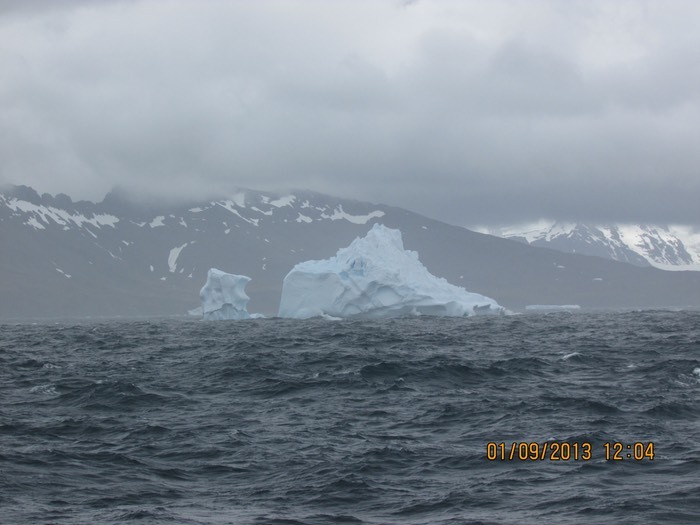 The iceberg on the left looks like an igloo. Sun was going down. We could see it from the cove where we took our hike. King Penguins molting by the stream. It has been normal for penguins to appear inquisitive when we visited, but when they're molting, you can definitely tell they don't want to be disturbed. There were no babies in this part of the cove. They were all huddled at the opposite end of the cove which we could only see in a "drive-by" with the zodiac. Yes I am cute but I bite! 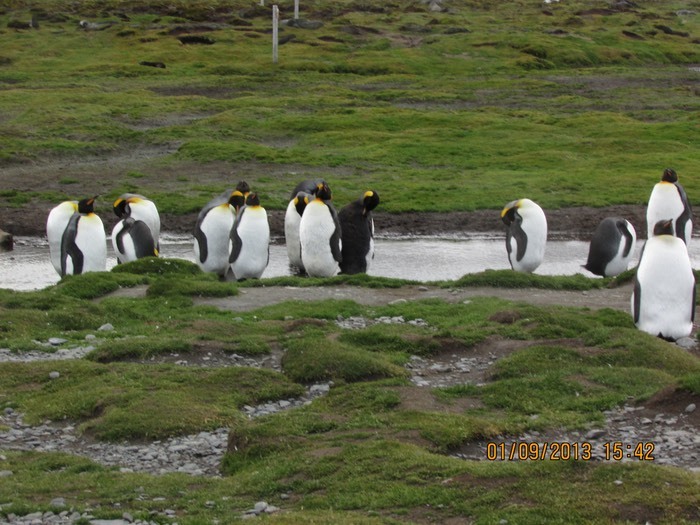 Molting King penguins huddled together near a stream. You can see penguins in different stages of molting. The ones with smooth coats have barely begun, the ones that look disheveled are further along. 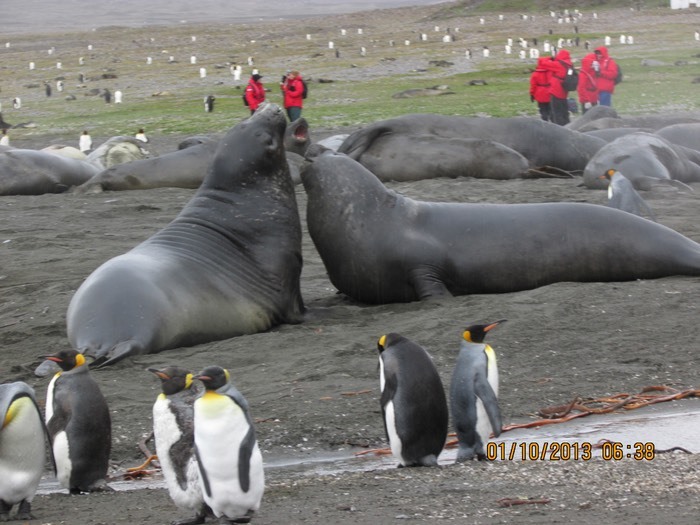 Head to head elephant seals with King penguins in the front. 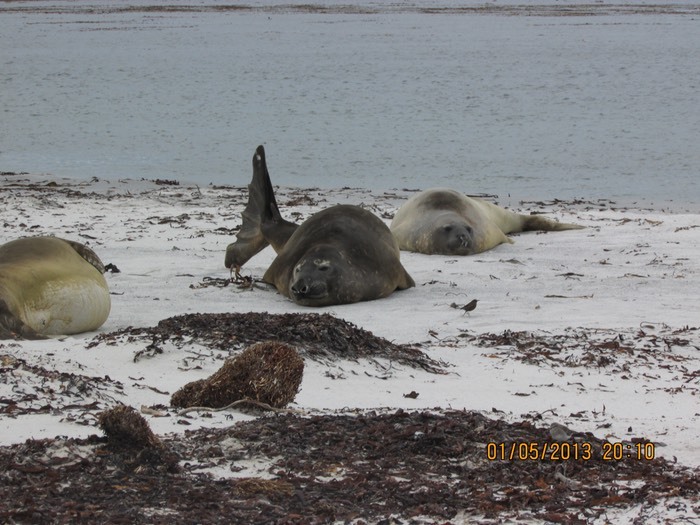 Elephant seals are molting and they burp and fart like crazy, and they aren't a bit embarrassed! The red coats in the background are fellow passengers. We were all given these red, fleece lined parkas and black backpacks when we boarded the ship. 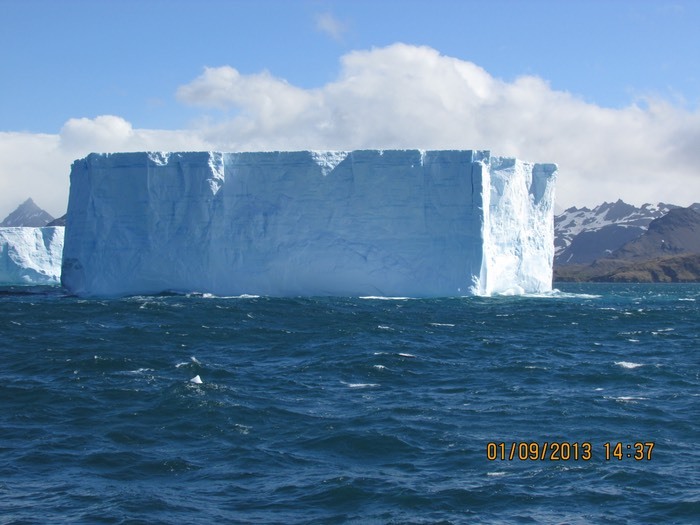 Spectacular icebergs in all shapes and sizes. Early this morning, at 7, we landed at St. Andrews Bay. 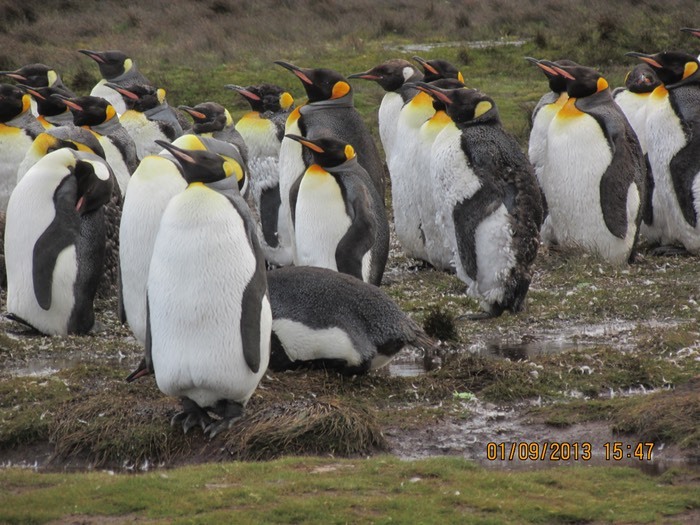 Our group went out to actually get close to the largest king penguin colony in the world. Again, we couldn't land where they wanted to take us, but we ended up close to both fur and elephant seals, as well as the king penguins. They were busy molting, i.e. standing very still. A few would walk to take a swim. They tend to walk in single file. Very cute. Each breed of penguin has a distinctive way of walking and one of the naturalists was great at imitating each one. I try to do the same as I visit their habitats. BTW, Jane was up before me and ready on time for our outing. She has been sleeping at night because the internet is so bad and so expensive, there's no TV, only a few preloaded movies, so the options are reading, schmoozing, or sleeping at night. That's it! I kind of like being disconnected. Didn't think I would. Later: we hiked to Gull lake. It was a very steep climb - someone on the staff said it was 200 ft. I think he meant 200 meters. We just went straight up on squishy waterlogged grass. I'm always good going up, but going down is another story. We descended down a gravel, rock strewn path. Not my favorite terrain. 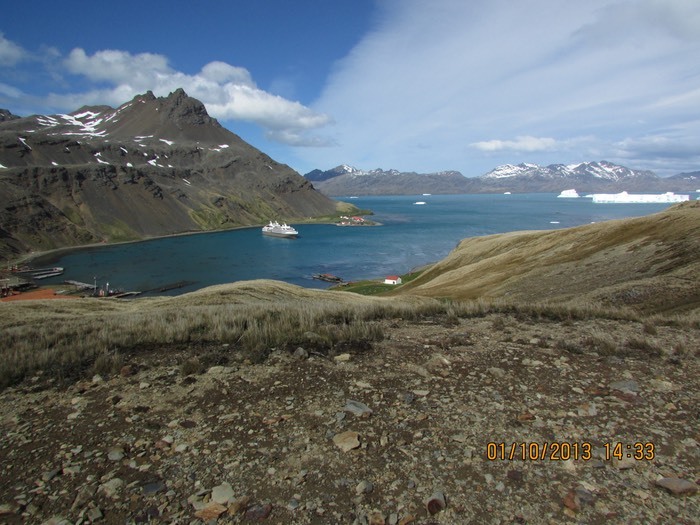 Great shots from on top of the hill of our ship anchored in the cove. Le Boreal anchored in Grytviken. This is from the summit and shows you the terrain of the path down. At the base, there was a gift shop, a church (Lutheran, of course, since the inhabitants were Norwegian,) a graveyard (including Shakleton's grave) and a couple of old whaling boats. It's not surprising that most of the inhabitants died in their 30's. 50 was a ripe old age in these parts. Shakleton died at 48 of heart disease. I forgot to mention that we've been viewing movies about the life of penguins. Wow - and I thought parenting was hard! Watching them in their natural habitat, you realize that zoos can never even come close to the environment in which they are meant to live. They are really awesome, noble creatures. 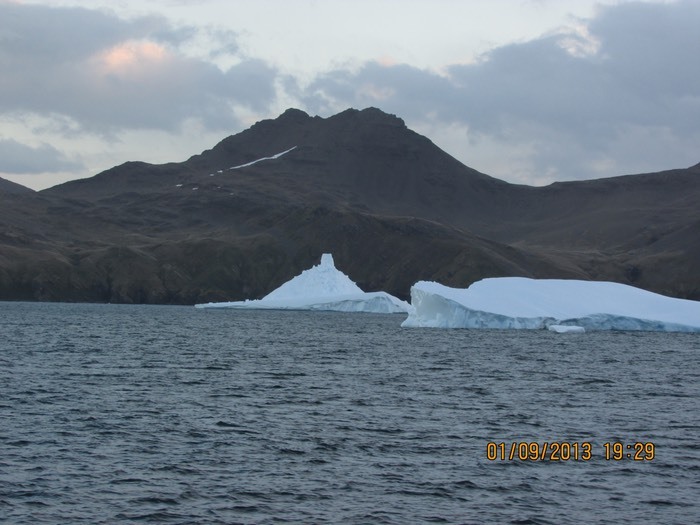 Tomorrow we will have a zodiac tour in the morning, weather permitting, and will view Drygalski Fjords from the ship.